Epic Games Senior Environment Artist Warren Marshall recently set out to refine his manual drawing skills. While Warren is both highly technical and artistic, he felt the need to revisit the basics and learn more about perspective. Carapace enables users to place up to nine vanishing points or as few as one. One-, two and three-point perspective grids are possible along with some extras to accommodate any weird angles in a scene. • Once the grid is in place, click CTRL+C and to place the grid on the clipboard. • Paste it into Photoshop and use it as a guide! Today, we’re very pleased to share Warren’s clever app with the community. Download Carapace here for free! Very useful app and thanks for giving this out for free! -after make 2 trace lines and CTRL+SHIFT+# to make a point, can you make it unselected? I've accidentally moved it after I made it. -I would love this to be a Photoshop plugin. I would love this to be a Photoshop plugin. I know, right? I wanted that too but I only had a few hours to work on this and I couldn't rummage up enough info on plugins to do it that way so I fell back what I knew! I should say great software.Small,simple but very useful !And you gave it for free which makes me feel only grateful ! It would be great if indeed this was somewhat linked to photoshop more directly so we can get the different vanishing points on a different layer,since having that much lines one over the other gets distracting and confusing(especially when we add VP3+).One simple idea could be to simply add a visibility toggle for a selected VP.Since now if I wish to save each VP on a separate layer I have to delete all other VP's to do that, and lose the position I have chosen or made traced. But overall I'm really happy with what you did.This won't make perspective drawing more easy but sure saves a ton of time.Finlay some artist did what should had been done a long time ago.Thanks man! I'd love for someone to make volume estimates that can be used as model checkers for modelling/prototyping in sculptris using box orthographic views, i.e. 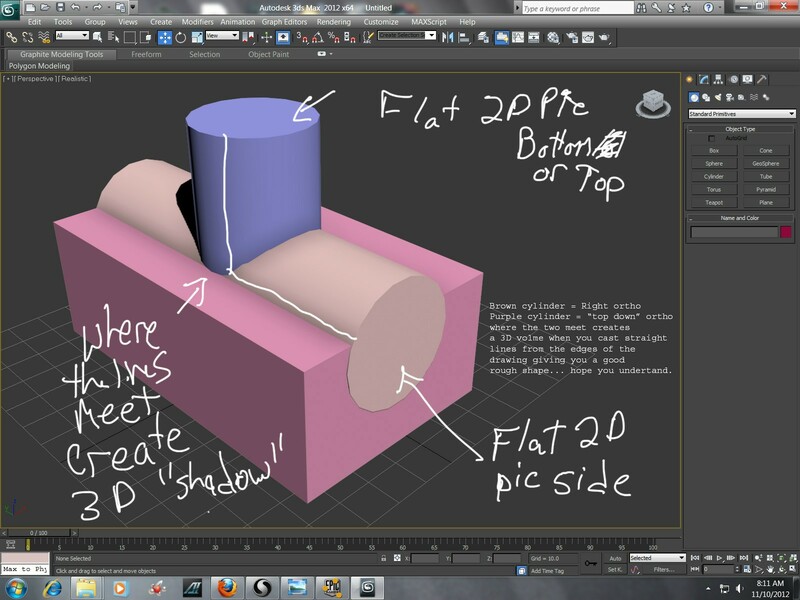 draw a line from side ortho and bottom ortho and where the line meets you get a rough 3D volume outline of the shape. It should be fairly easy to cast lines based based on correctly oriented bitmaps on the sides of a box. I'd love to have a tool like that and it should be fairly easy to write one. If someone can pass the message on to someone at epic that could poke someone to make it, I'd love you guys for eternity. Yep, copying each point to a different layer is something I'd like to do. I think I'll add a toggle to disable the selected point so you'll be able to copy out the points you want without having to delete the others. It's on the list! I don't entirely follow what you're asking for here. Is there a link you could send me that explains it better? Get a blank sheet of paper. Bend one in half so it forms the side of a box. Imagine a 2D orthographic view of some drawing from the side on the the side of the paper (we'll use a circle in this example). Now imagine a circle on the bottom flat portion. Now imagine a STRAIGHT LINE coming out from a single point on the circle going straight up from the bottom, now imagine a straight line coming out from one point on right side so that both lines meet in the middle. Where the lines meet form the beginning of a shape, you repeat that process for each dot on an outline and you get a 3D volume. I got a pic here... I'm simplifying a bit here because usually you want back/front ortho as well but you can see the potential for skilled artists to make up any deficit esp when checking work/trying to find the right 'look' and compare against things you've photgraphed, seen, etc, etc. Thanks for this tool - it looks really useful. I'm having a problem with it though - while it works on my Windows 7 laptop, when I try to use it with my Windows XP tablet PC, I get an error message ('Carapace has encountered a problem and needs to close'). I looked at the Event Viewer and it says 'The process was terminated due to an unhandled exception'. Is Carapace not suited to the tablet pc edition of XP? Warren, this is a super dope tool. Any chance of a Mac version? I have .NET 4.0 installed already, so I'm inclined to think that it's an XP issue. If you can't find the problem on your own, would it help if it was open sourced under a restrictive license? That way, more people could contribute to it, maybe port it to Mono (for the Mac users), and hopefully find the problem with my XP machine. Hi.Just wanted to note that besides having fun with it....I started using it in an project and it really speeds up things!Really thanks man!May love light be with you in all your work! This is a dream tool for me as an Illustrator. Thanks so much Warren!